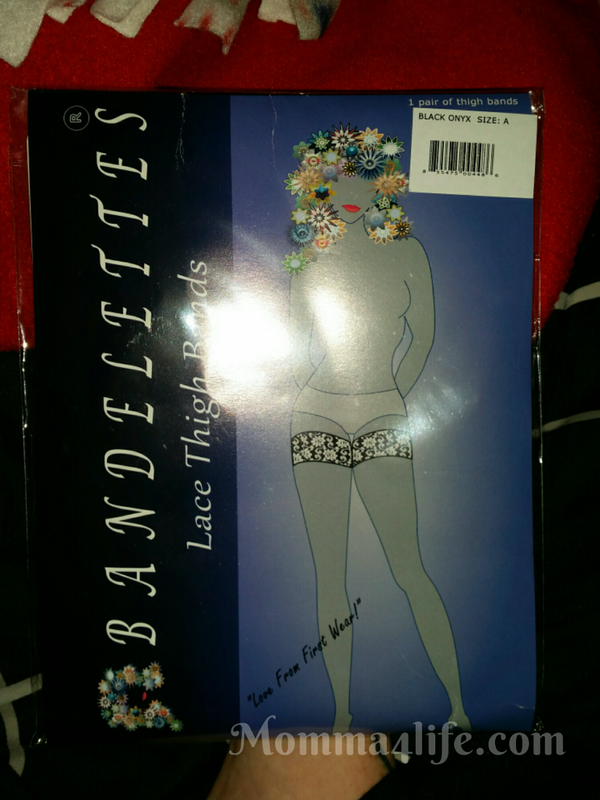 To tell you about the Bandelettes anti-chafing thigh bands these bands are great to keep around the upper leg area for your chafing needs. These are great to keep on your thighs so your legs don't rub together. If you have a issue with that. They also come in a beautiful lace design and a variety of different colors. The color I chose was black because black is a classic color that goes with anything. All you do is basically slip them on like a garter around both upper thighs. These are very fashionable. Chafing happens not due to any excessive weight but more often do to your body structure and the way you are built. Some people happen to have no thigh gap but the people that do you don't have to worry about this. They help to protect and decorate your thighs the stretchy and delicate lace bands have a non-slip silicone that provides comfort and ease. The word Bandelette is a French term for the embellishment on the top of a column. These anti-chafing thigh bands come in six sizes covering regular and plus sizes from size 2 up to size 22 there are various colors and styles. I never knew about these until reviewing this product and I have to say they are pretty amazing. Question of the day what have you used in the past to help prevent by chafing?